Performance driven metrics help a WooCommerce business measure its different facets and adjust your actions thereby. On the other hand, KPIs are really useful to gauge the actions and performance relative to a specified number of business objectives or goals. To become successful in the cut-throat competitive eCommerce business industry, you must consider measuring metrics and KPIs so that you can get to know what's happening around and inside your business. Although there are a wide array of sources containing tens of hundreds of important data yet only a few of them are most relevant and significant to control the fate and entity of your business. Now, let's explore the most essential WooCommerce metrics and KPIs that can provide your WooCommerce store with proper directions to get a sustainable growth and to reach a whole new set of dimensions! Not all quadrilaterals are squares but all squares are quadrilaterals. Metrics are like quadrilaterals when KPIs (Key Performance Indicators) are like squares. This means, metrics are very broad criteria but KPIs are narrowed down to the most important keys that align with your business goals and objectives. However, metrics can be quantitative or qualitative, predictive of the future, or revealing of the past in nature. For instance, startups trying to find product-market fit, need to rely on qualitative data rather than quantitative ones. In this scenario, startups may collect customer reviews and compare those with one another according to the nature of those reviews like positive sentiments vs negative sentiments so that they can get to know whether they achieved product-market fit. 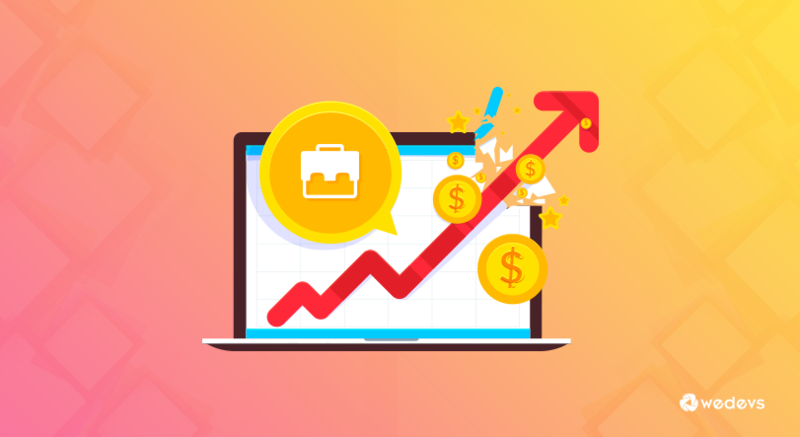 Sales: As a WooCommerce store owner you can monitor total sales within a specific time frame like hourly, daily, weekly, monthly, quarterly, or yearly basis. Tons of free web analytics tools are there to serve this purpose that is to know the number of total sales and so on automatically. Cost of goods sold (COGS): COGS denotes how much you spent to sell a product including overhead costs, employee wages, manufacturing costs. But to get the most specific insights, you can use this formula (Total number of goods sold= Beginning Inventory + Purchases during the period – Ending Inventory) for assessing the total number of goods sold to determine your actual cost of goods sold during a specific time period. Average margin: Average margin, or average profit margin, is a percentage that represents your profit margin over a period of time. You may want to know what portion of your sales price is actually profit and what portion is responsible for compensating the cost of goods. The percentage expression of profit margin helps you get to know just that. However, you can calculate the average of these two profit expressions to get a better representation. Number of transactions: You can compare the total number of transactions in combination with total site visitors or the average size of orders so that you can measure and compare your website's capability with other WooCommerce websites. This KPI is really useful to get much deeper insights of your store in order to compare with industry standards. Add to cart: This indicates how many users of your website is adding your products to the carts. You can keep track of the items until your user leaves your site. Luckily, there are some free tools that can keep track and measure this rate that can be used to re-target your lost customers who didn't complete the checkout. Conversion rate: It's the rate that indicates how many site visitors are finally becoming your paying customers or simply converting to paying customers by buying your products. This is significantly important to get to know the buying behavior of your customers. Mathematically, Conversion rate = Total number of conversions ÷ Total number of visitors. Learn more. Shopping cart abandonment rate: This rate refers to the number of potential customers who are adding your products to the shopping cart but are not completing the check out process which is not a good sign for your store. The lower this rate the better for your store. If you have a low Shopping cart abandonment rate you can optimize frictions, for example, you can omit the “buy later” button which is distracting while completing the checkout process. Revenue per visitor (RPV): RPV is the average time of how long your visitors are staying at your site during a single visit. You can use the web analytics to know this time. The lower the time is the better. After comparing the time to the industry standard, you may have a lot of areas that can be improved like you can use popups displaying “Get discounts for the first time purchase” which can help you retain the user from leaving your site too early. Why are KPIs important to your WooCommerce business? KPIs are like the milestones on the way to your business's success. At its core, it's aimed at driving actions which tell if your business is moving towards the right directions or not. What’s even more important is that keeping track of KPIs on a regular basis will help you make informed decisions regarding your WooCommerce store and concentrate on and invest in initiatives which can expand your business. Proper actions intended to improve your WooCommerce website using KPIs can improve the overall experience for any stakeholders of your business. KPIs tells the whole story of your website at once which can be taught to any employee so that everyone stays on the same page. Make informed decisions based on stats not just with gut feelings or any other unfounded hypothesis. Some KPIs can be deployed to retarget your lost customers to maximize your sales volume. These are the widely practiced KPIs among a plethora of metrics by most of the successful WooCommerce stores. To be honest, there's no hard and fast rule to set metrics and KPIs for your WooCommerce store. It entirely depends on your business goals, objectives and needs which may vary from business to business. However, you may need to keep measuring and optimizing your website performance on a regular basis. Finally, you can use a free web analytics tool like WooCommerce Conversion Tracking to measure the important conversion rates taking place within your WooCommerce store to drive prolific yet viable growth.